I have two Apollo 60/910s, a circle k 4013 and a later circle t 4016. To my beginner's eye, the 4013 has the better quality mount - solid, lots of chrome and practically no plastic. However, one thing that is missing which I found peculiar are setting circles. These are present on the 4016's mount. My question is how common were setting circles on these types of department store eq1 mounts? Did the average observer use them? The average observer didn't use them. Mostly because most found it too complicated and on many mounts they were/are too small to be usable. They were pretty common, though, but were frankly often little more than mere decoration. 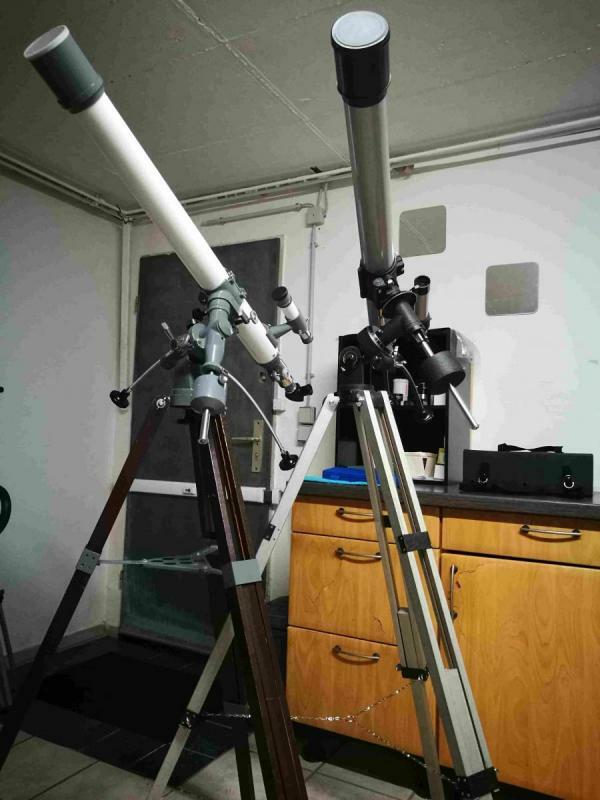 Of the many telescopes I've owned or used the only setting circles I've ever found useful were those on a 3.5" Questar and a C8. If I can't see it or star hop to it I use GOTO. Your first picture looks similar to a 7TE-2 mount. The setting circles are too small to be of any real use. Hmmm...........my first 'serious' telescope was a Celestron C90 Astro. I was able to find plenty of objects with it. In 1981 I bought a C8. I had no trouble using those setting circles. Used them to find all of the Messier objects and a whole bunch of NGCs. As to the ones on the old spindly mounts, I don't think they were too much fun to use. They weren't. Been there, done that, got the T-shirt. All my EQ mounts have them, maybe 1 out of 20 times out I set them up, and often to find just one object. 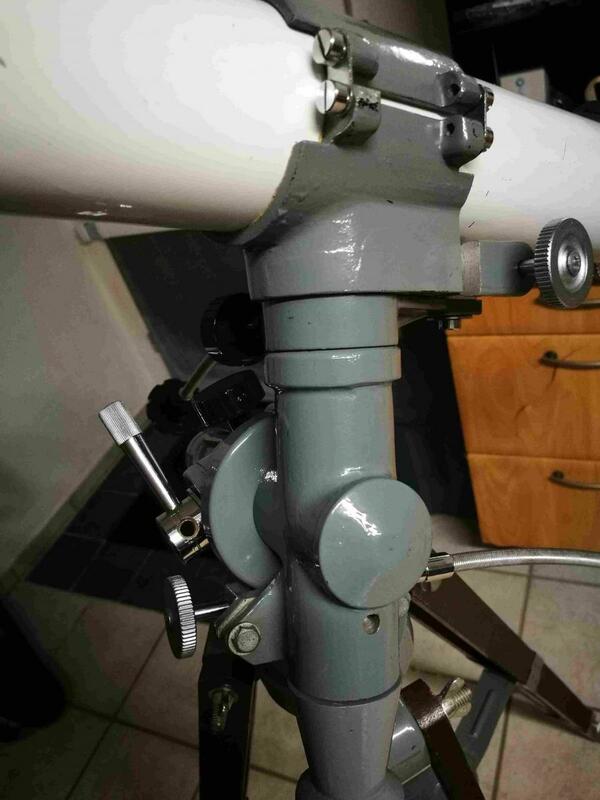 IMO, since I use them frequently, the 7TE-2 mount, like the above 4013 mount, is not spindly. The 4016 like my 6305a mount are not as good as the other two. The tripods are another matter, and I have "fixed" them. 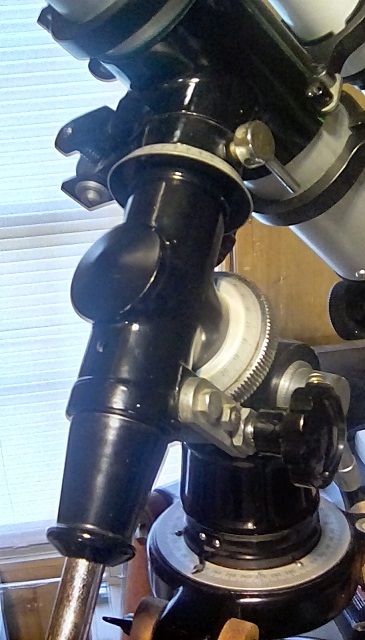 For the topic, the setting circles on those vintage mounts weren't very large, and they were common on many of the "department" store scopes. Seeing yours without them though, does look good. It's not worse that reading a map with a red light, if the setting circles are easy to read. But why they have to be so small is a complete mystery to me. On many mounts they could easily have been 4" - 6" in diameter without even having to change anything else on the mount. 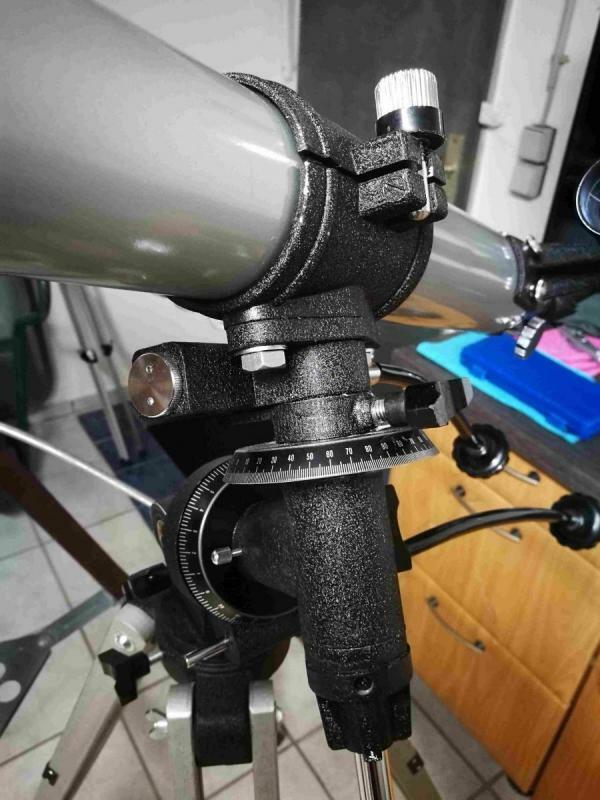 And if the mounts had been designed for them, even mounts for small telescopes could have 6" - 10" diameter setting circles. Just imagine how much easier they would be to use. Well, that's it..... a few of the vintage mounts had decent circles on them, so the makers indeed knew how, but..... I think most of the smaller mounts were made very inexpensively but 'real' looking, knowing that most would see starlight only once or twice, so why put the machine time into better stuff that won't get used anyhow...? It's too bad...because with decent circles and some experience, (and appropriate lighting), they are faster, quieter, and just as accurate as GOTO....except you have to have charts available to get the numbers. "But why they have to be so small is a complete mystery to me." They were designed for appeal at minimal cost by people who likely never used them. They are usable and better than nothing if all one has are coordinates but amateurs discovered more effective methods of navigating the sky. on my C8 (black tube model circa 1990), the dec circle was off by several degrees, with no apparent way of adjusting it. with the 35mm plossl (my widest 1.25" eyepiece at the time) giving about 50 arcminute field of view, that error was more than enough to put things completely out of the field. I never did get a 2" diagonal back for that scope to try and get a wider field. The Zeiss Telementor GEMs, and also Unitron GEMs have very servicable setting circles- the black Unitron setting circles with white gradations and numbers (why did they make them shiny silver for a while!? ). Also, back in the day, my very first GEM was the Edmund 5/8” shaft mount that had those black fiberboard setting circles with printed white numbers and gradations and the nails set in the shaft collars for indexes. I actually got pretty good with them and found lots of things with their help. Where there’s a will, there’s a way! I also agree that the ones on my Questar, and also my orange C8 and C5 are very usable setting circles. They need to be big- 3” or more, and they need to be readable!